A student who is interested in documentaries might read the section of the Custom-House sketch in which Hawthorne describes the Federal eagle and compare the description to photograph of the eagle. This student could then write an essay discussing the differences between Hawthorne's eagle and the actual eagle sculpture, and speculate on reasons for the differences. For example, a student could consider whether Hawthorne was a poor observer and look for other evidence for this position by comparing other descriptions in the Custom- House sketch with material evidence found on the web site, or could explore the ways Hawthorne alters descriptions to suit his literary needs. A student interested in architecture could look at the video on the Federal style, and at the rollover page. This student could then look for examples of the style in their own community and write an essay comparing local buildings to the Custom House. A student interested in history could read the letters from Collector Lee and Perley Putnam and from the carpenter, painter and mason who built the Custom house and compare these to architectural drawings and historical photographs of the building. The student could then write a history of the construction of the Custom House, citing this material. You have been using a Web site to explore the life and work of Nathaniel Hawthorne. One advantage of this is that you can see reproductions of a large number of texts and images that are housed in museums and research libraries without having to travel to those places. Many of these primary source materials would be difficult for you to access without this Web site. You would have to travel to Salem and spend a great many days locating and viewing them. By using this site you can read old newspaper columns about Hawthorne's firing and see nineteenth century postcards of the Custom House right away from your school or home computer. Of course this deprives you of the experience of having in front of you a piece of paper that Hawthorne actually signed. You also cannot feel the excitement of locating those old newspaper columns or postcards yourself. However, since it would be difficult for most students to do research at the Phillips Library or the Salem Maritime National Historic Site, this Web version of primary source materials is the next best thing. There is an additional benefit of using digital materials on the Web. There are computer technologies that allow you to go beyond reading a text or looking at a still photograph. 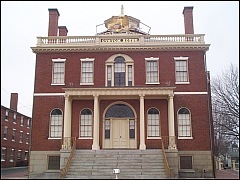 Digital panoramas can allow you to visit a place -- the Custom House, for example -- through a simple sort of virtual reality. In this Explore Activity you will compare the sorts of impressions that you can form using three different technologies: texts, still pictures and digital panoramas. This will allow you to see what each might be especially good for and also what might be lacking. You are going to begin by reading about the Custom House and answering some questions that will clarify what a text can tell you about a building. Next you will view some still pictures of the Custom House and consider what images can tell you that texts cannot. Finally you will look at the panoramas and decide what they offer that goes beyond either the texts or still pictures. You will also be asked to think abut problems that may arise with the panoramas and the other digital reproductions. You are going to read a set of pages from the Historic Structure Report, a book by preservationist Orville Carroll that was commissioned by the National Park Service. The Historic Structure Report explains how the Custom House came into being and records all of the renovations and other changes to the structure through the 1970's. Click the following links to open up the pages, than read through them. Now I want you to consider what this text can and cannot tell you about the Custom House. Write your responses to this set of questions. 1. What was the first issue facing the builders of the Custom House? 2. How did the Treasury department decide which architectural style to build? 3. Why wasn't the Custom House finished on time and on budget? 4. How did an unresolved issue from the construction of the building find its way into Nathaniel Hawthorne's writing? 5. Does the Custom House strike you as an elegant or a utilitarian building? 6. Do you imagine the building to be large or small? 7. Would the interior be dark or airy? 8. How many rooms does the Custom House have; how are they laid out? Notice that you can discover the answers to some of the questions fairly easily. Others are more problematic. For example, you can answer the third question by looking up the apropriation for the Custom House, the actual cost after construction, and the dates that the various workers submitted bills. It is much harder to justify an answer to question seven. To do so you have to imagine yourself inside the building and make a guess about how much light gets through the windows. You don't know if the Custom House faces north, south, east or west, or if there are large trees or tall building surrounding it. You don't even know how big the windows are or where they are placed. At best you might be able to figure out how many windows there are. The text describes the whole process of construction and subsequent work on the Custom House. This sort of history is very useful if you want to discuss how the Federal government commissioned public buildings in the nineteenth century. It may also be a good thing to know if you want to trace the changes made to the Custom House over time. What this or any text cannot tell you is how the building looks and what it might be like to be inside. For that we must turn to another technology -- pictures. Close the first set of pages by clicking in the upper corners of the pop out windows. Now you are going to examine a set of still photographs and drawings from the Historic Structure Report. The photographs show the Custom House at different dates throughout the nineteenth century. The architectural drawings and plans depict the layout and details of construction. Facade of the Custom House in 1855. Exterior of the Custom House about 1870. Now write your impressions of the Custom House based on viewing these images. You may use these questions as a guide: 1. Was the Custom House a large or smallish structure compared to its neighboring buildings in Salem? 2. Would you say that this is an elegant building or a utilitarian one? 3. How many rooms does the Custom House have -- how are they laid out? 4. Is this a dark building or is it light and airy? 5. What was the neighborhood of the Custom House like? 6. Did the Custom House change a lot or mostly stay the same through the nineteenth century? 7. Can you tell how finished the building is inside? 8. Would you feel cramped inside the Custom House or awed by its spaciousness? You can form a much more detailed picture of what the Custom House looks like after viewing these pictures. It is fairly easy to answer questions like one and three. You can see not only the Custom House but also its neighboring buildings in a number of photos. On the floor plan you can count the number of rooms and easily see their relationship to one another. However, the photos and drawings do not tell you anything about the process of commissioning the building as the text did. They also do not give you any sense of what it would be like to actually be there at the Custom House. You would be hard pressed to answer questions seven and eight with anything other than a guess. Architecture affects us emotionally. Think about your different reactions to entering a monumental courthouse or museum versus a cozy wooden cottage. You may have felt awe in the first case and felt welcomed in the second. In addition, the way we move around in buildings has an effect on us. A nineteenth century brick office building can constrain our movements as we walk down short, narrow hallways. Modern steel and glass skyscrapers can energize us with their long, sweeping corridors. It is difficult to get this sort of "feeling" about the Custom House from looking at the still pictures. You cannot really imagine yourself moving from room to room inside -- you have not seen anything that can help you imagine what this would be like. To do so we must turn to a third technology -- virtual reality. Close the second set of pages by clicking in the upper corners of the pop out windows. Now you will look at three panoramic tours of the Custom House. Aaron Toleos and Jan Arabas created these panoramas in the fall of 2002. The first is an exterior view of the Custom House and its Derby wharf neighborhood. The others are interior views of the Surveyor's Office and the Collector's office, both located on the first floor of the building. To navigate these panoramas, click and drag your mouse across the images. Hold down the shift key to zoom in. Hold down the option/alt key to zoom out. Now write your impressions of the Custom House based on viewing the panoramas. You may use these questions as a guide: 1. How does the Custom House feel -- awe inspiring, cozy, quietly grand? 2. Is your impression of a large or smallish structure? 3. Would you say that this is an elegant building or a utilitarian one? 4. What can you say about the layout? Is it easy to move around? Cramped? 5. Is this a dark building or is it light and airy? 6. What is the inside like -- how finished does it look? How many people can it accommodate comfortably? Is it what you expected based on your impressions of the outside -- or were you surprised at what it looked like? 7. What is the neighborhood of the Custom House like? 8. The Surveyor's Office is maintained much as it was during Hawthorne's time while the Collector's Office went through a major modernization in the 1880's. Compare the two. 9. How has the Custom House changed since the nineteenth century? 10. Imagine that you are a nineteenth century sailor who as gone to the Custom House to present your papers? How does the building strike you? Are you proud that your government has such a building? Does the Custom House make you hate bureaucracy? The Custom House panoramas allow you to take a look around; they duplicate the experience you might have if you visited the actual building and spun around in a circle. You are able to answer questions such as six, seven and eight with much more surety than if you only had still pictures. You can get some sense of the size of the Custom House, the amount of light inside and the overall look and feel of Federal architecture that only comes from visiting the inside and outside of a structure. At the same time I want to point out that this experience is somewhat distorted. The panoramas do not really duplicate the experience of visiting the Custom House. You cannot look up or down. Your ability to take a close look at a pen or an inkwell or a window molding is severely restricted. The panoramas make the Surveyor's Office seem more cramped than it really is. They do not really help you figure out how a person would walk from room to room, or how far any room is from another or how many people could comfortably enter the Collector's office at once. In spite of the limitations, the panoramas are the best tool if you want to simulate a visit to the Custom House. They give you a sense of moving through and around the building. You can look behind you. You can look to one side to peer at the surveyor's bookcase and then to the other to glance out the window. Of all the technologies, the panorama is the one that helps you decide whether this is an elegant or plain sort of building, because you can see how all the details add up -- the gothic muntins spilling sunlight onto the high ceilings and the door moldings, for example. The still pictures are the better tool if you want to see what the Custom House has looked like at various points in its history. The text is best if you want to piece together an account of how the building came into being in the first place. I might say that the panoramas give you a sense of place; the still images give you a sense of time, and the text gives you a sense of meaning.